We love this festival style wedding our bohemian bride Lorna planned with her new hubby Paul! With the perfect country setting, marquee, great weather and some very festival-esque details, their friends and family had a private festival day all to themselves! 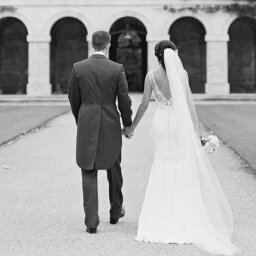 Lorna wore Elle by Savannah Miller, a heavy champagne silk charmeuse featuring matt and shine satin seam detailing. This gown has a built in stretch satin and power net intelligent base layer system. 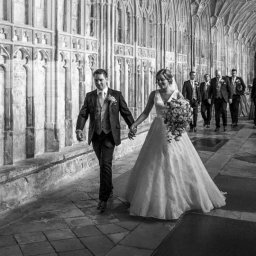 I wanted to get in touch to say the biggest thank you for helping me with the dress (and magical cape!) of my dreams for our wedding. From the first moment my sister and I walked in to your beautiful shop, to leaving with a very special dress in my hands, you were absolutely amazing. I was a little nervous for the whole dress shopping experience, but you immediately put me at ease and filled me with confidence – so thank you so much for that, it really did mean a lot. As for the dress, comments from friends and family have ranged from: ‘pre-raphaelite princess’ ‘ethereal’ ‘elegant’ to ‘peaky blinders bride’ all of which I LOVED! And one thing everyone said was how comfortable I looked in it, which was so important to me. Please also send my huge thanks to your dress maker as she did such an amazing job, it fit so perfectly and she is so lovely. I had such a lovely time at the fittings! 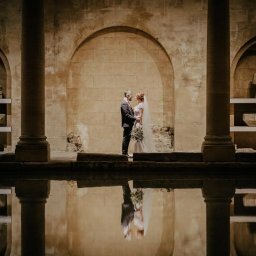 Lorna and Pauls photography was all taken care of by Tom Durn, you can see some of their great shots and get some festival wedding inspiration below, enjoy! Make up for the big day was done beautifully by Victoria Abbosh, who also had the pleasure of doing the make up for the bridesmaids and Mother of the Bride!